Black Panther (Origins) Today I’ll be giving you the history of the fist black superhero “The Black Panther” He started out in the early in #52 in July 1966. He is the first black superhero in mainstream American comics. T’Challa is the Black Panther, king of Wakanda, one of the most technologically advanced nations on Earth. He is among the top intellects and martial artists of the world, a veteran Avenger, and a member of the Illuminati. Using his powers and abilities, he has pledged his fortune, powers, and life to the service of all mankind. Long ago, a huge meteorite made of a rare mineral now known as vibranium, crashed landed in Wakanda. The first king of Wakanda, Black Panther Bashenga, harnessed the mineral and used it to nurture his nation. Thousands of years later, under the ruling of Black Panther T‘Chaka, Wakanda’s level of technological and economic achievements continued to excel far beyond those of the modern world. T’Chaka concealed Wakanda from the rest of world to prevent it from being manipulated by outsiders. His first wife, N’Yami, died while in labor with Prince T’Challa. Years later, a Dutch scientist named Ulysses Klaw found a way into Wakanda, created a vibranium sound-based weapon, and used it to kill King T’Chaka. Prince T’Challa, only a child at the time, managed to turn the sound weapon on Klaw, destroying his right hand. Klaw fled the country, exposed Wakanda to the outside world, and vowed revenge. Prince T’Challa would later become king after defeating his uncle, King S’yan, in a once-a-year ritual that allowed anyone of Wakandan royalty to become king/queen by defeating the current ruler in hand-to-hand combat. Given the fact that the ruling Black Panther possessed enhanced and superhuman abilities from digesting the Wakandan Heart-shaped Herb, the chance of an average man defeating a Black Panther was slim. However, T’Challa succeeded. He also digested the Heart-shaped Herb, which gave him superhuman senses and provided him with enhanced agility, strength, and over all physical capability. Created in 1966 by Stan Lee and Jack Kirby, the Black Panther, has traditionally been the warrior king of the hyper technologically advanced African nation, Wakanda. Using his superhuman senses of sight, smell, and hearing combined with his enhanced panther-like reflexes, he divided his time as a king and crime fighter. During the characters first debut, Stan Lee scribes the African hero defeating the American superhero team, the Fantastic Four. Several years later, in 1968, Roy Thomas scribes the character’s first appearance as an Avenger. In 1972, after the first four issues, the Black Panther becomes the titular character of Don McGregor’s Jungle Action. McGregor’s “Panther’s Rage” is one of the most critically acclaimed stories of the Black Panther mythos. The co-creator of the Black Panther, Jack Kirby, would later go on to illustrate and scribe the hero’s solo series in 1977. In 1998, Christopher Priest began writing the Black Panther’s following series. Priest modernized the character by building and expanding upon the Black Panther mythos mapped out by Lee and McGregor. In Priest’s retcons of Wakanda, he established Bastet (the ancient Egyptian God) as the panther god that the Wakandans built their religious cult of the Black Panther around. Prior to this retcon, the Wakandan panther god did not have a name/origin. Priest’s interpretation of the Black Panther is widely praised. In 2005, TV/movie scribe Reginald Hudlin began writing the Black Panther. Hudlin’s tenure retconned a lot of what was previously established about the character, as he rebooted the heroes adventures. However, major establishments, like T’Challa being a warrior king, all stayed true to the classic tales of the Black Panther. Hudlin’s tenure on the Black Panther is the most commercially successful series of the Black Panther franchise. He also created Shuri, T’Challa’s younger sister, who he would later scribe becoming the new Black Panther in 2009. To test his powers, fighting skill, and genius, King T’Challa invited the American superhero team, the Fantastic Four, to Wakanda. The FF were amazed at the Wakandan man-made “techno jungle”, commenting on how amazingly real it seemed. Although Reed Richards (Mr. Fantastic) knew it was man-made. The Black Panther then attacked, neutralized, and defeated the Fantastic Four individually by using a combination of technology, built into his panther costume, and his superhuman panther like abilities, which he explained came from eating a rare herb and secret Wakandan spirit rituals. T’he Panther later revealed himself to be King T’Challa and apologized for attacking them. He explained that he wanted to test their abilities to see if they would make effective allies against Klaw and his mercenaries. They all became fast friends and allies. Elsewhere, Klaw returned to Wakanda and began attempting to invade the country. He wanted to use Wakanda’s rare substance, called vibranium, to turn sound into a weapon. With the help of the Fantastic Four and the Wakandan Military, T’Challa was able to defeat Klaw and his enforcement. T’Challa realized, the more Wakanda continued to excel into a technological powerhouse, the more grave the threats of world would bring his kingdom. He then pledged his fortune, his powers, and life “to the service of all mankind. After this adventure, T’Challa teamed up with Captain America and Sharon Carter in order to defeat an impostor posing as the deceased Baron Zemo. This resulted in the forging of a strong friendship between Captain America and the Black Panther. For the next several years, T’Challa lived two lives; one as crime fighter and the other as a king. The many threats to his kingdom continued, causing him to be cautious of super-humans. Now a hero, servicing all of mankind, he became curious of the Avengers. Unsure if they were a threat to humanity of not, T’Challa decided to investigate the group of super-humans by infiltrating their rankings. When the Black Panther traveled to Avenger’s Mansion, he snuck into the facility only to find that the Avengers were dead! Jasper Sitwell walked in moments later and by the looks of it, T’Challa had killed Goliath, Wasp, and Hawkeye. It is later revealed that the “Grim Reaper” had put the Avenger’s trio in a death like stasis, framing the Black Panther. The Panther managed to defeat him and rescue the Avenger’s trio. He was then offered membership to the Avengers, which he happily accepted. T’Challa would go on to have many adventures with the Avengers, becoming a veteran member, all whilst ruling to his kingdom. He also provided the Quinjet, which would become a mainstay of the team for years to come. During his time with the team, he developed a high-tech flight suit for Captain America’s partner, the Falcon, and formed a friendship with the young African-American hero. While in Wakanda, T’Challa received word that a member of his American-based children’s charity had been murdered in cold blood. In an attempt to console the young child’s family, he traveled to New York to investigate the situation. Meanwhile, Micheal Achebe, a citizen of a neighboring Wakandan country called Ghudaza, initiated a coup d’état becoming Wakanda’s usurper. Ghudaza was a midst a civil war and T’Challa protected some of its citizens by allowing them to live in Wakandan refugee camps. Achebe lived in one of those camps, which gave him access to Wakanda. With the help of the demon Mephisto, he was able to over throw T’Challa. Mephisto’s gift to Achebe allowed him to manipulate the Wakandan people into accepting him as ruler alongside T’Challa’s stepmother, Ramonda. In return, Mephisto would get to devour a “noble soul”. After uncovering Mephisto’s involvement, T’Challa attacked him, ripping out the demon’s heart. He was then transported to “hell” where he offered his own soul in exchange for Wakanda and Achebe’s freedom, under the impression that Mephisto was possessing Achebe. Mephisto accepted the offer, but revealed that Achebe willing sold his soul to him. Mephisto proceeded to try to devour T’Challa’s soul, but was unsuccessful because of the Panther God’s spiritual connection. Hundreds of previous Wakandan kings appeared before them in the form of actual panthers. The panthers then attacked and entrapped Mephisto in hell, as T’Challa escaped to hunt down Achebe. After T’Challa attempted to make contact with Wakanda, via satellite, Achebe threatened to destroy all of Wakandan if he were to ever return home. As a result, T’Challa was exiled from Wakanda with the Wakandan citizens accepting Achebe as usurper due to conditions within Wakandan law. T’Challa remained stateside in New York, attempting to uncover Achebe’s other allies, because he knew that Achebe wasn’t working alone. It is later revealed that Achebe was working with the United States intelligence community, Russia, and the Latin-American terrorist state, Domuyan, in an attempt to exploit Wakanda’s vast technological advancements. However, King T’Challa had predicted that this would happen years prior, but was uncertain which of the three countries would initiate the attack first. He quickly began a counter maneuver. T’Challa presented the coup d’état to the U.N. Security Council and acknowledged it as an act of war against Wakanda, verbally declaring war against the United States. Afterwards, he and the Dora Milaje, along with Monica Lynne, were approached by Hunter the White Wolf, who wanted to help T’Challa take back Wakanda. A midst conversing about a potential team up, they were all separated by a surprise attack by the US & Russian secret services. Elsewhere, after hearing that T’Challa verbally denounced war against the United States, Achebe began destroying Wakanda, with its own technology, to prove to T’Challa that he was in control of the country. Also, hundreds of Ghudazai soldiers invaded Wakanda under the order of Achebe. Back in New York, Monica Lynne (T’Challa’s ex-fiancé) was attacked by the Russian mob after T’Challa and Hunter went off to fight the secret service. The Dora Milaje, however, were able to protect her. Hunter is 12 years older than T’Challa. As a baby, he was the lone survivor of a plane crash that landed outside of Wakanda. He was then raised and declared a Wakandan citizen by King T’Chaka (T’Challa’s father). He became the leader of Wakanda’s secret police, the Hatut Zeraze. Hunter would do anything he could, no matter how violent, to appease King T’Chaka. Upon becoming king, T’Challa disbanded the Hatu Zeraze and Hunter decided to leave Wakanda, which is why he was in New York. T’Challa accepted Hunter’s offer of assistance and Hunter vowed absolute loyalty to him. However, T’Challa’s acceptance was all a ruse. He did not trust Hunter, citing his excessively violent history, as the reason why. T’Challa later knocked him unconscious, regrouped with the others, and flew to Wakanda to face Achebe. When he finally confronted Achebe at the Wakandan Palace, T’Challa allowed himself to be captured. He knew that Achebe would flee the country in fear, basically exiling himself, making him ruler again. When T’Challa escaped Achebe’s deathtrap, he was confronted by Hunter. The two engage in combat, which ended with T’Challa using a pinched never technique. They then flee the palace, going their separate ways, as Achebe’s explosive devices detonate. After teaming up with the X-Men a few times, T’Challa and Ororo Munroe (Storm) began dating. After T’Challa helped her reunite with her surviving family members in Africa and the U.S., he proposed to her. She agreed and the two were married in a grand Wakandan ceremony. For their honeymoon, the two embarked on a diplomatic world tour. They visited Latveria (Doctor Doom), Britain, Atlantis (Namor), and Attilan (Black Bolt) before traveling to the United States. Once there, they found that the country was a midst a Civil War. While visiting the White House, the authorities attempted to force Ororo to sign the Superhuman Registration Act. This resulted in the Royal Couple choosing to side with Captain America & the Secret Avengers in the war against the act. A midst the events of Secret Invasion, The Skrulls try to take over Wakanda, for their vibranium ore. As a result, the Wakandan-Skrull war began. T’Challa began to defend his nation with cunning tactics and technological marvels. Eventually, the two factions found themselves at a loss of technological weaponry. As a result, the two forces began to use old fashion and more primitive weaponry such as, the sword & shield. T’Challa was able to defeat the “Super-Skrulls” (including a massively large Skrull with the abilities of Iron Fist, Wolverine, Luke Cage and Bullseye), while Shuri and Storm lead an infantry legion against the Skrull. When the Wakandans started to decline, the Skrulls managed to capture Storm, threatening to kill her. With the Desturi coup successful, they made Storm, S’yan, and Ramonda their prisoners. Meanwhile, T’Challa, Shuri, and the Dora Milaje, teamed up with the Fantastic Four and a few X-Men in an attack on the Desturi. T’Challa and his allies managed to take back Wakanda, freeing all Desturi prisoners. Elsewhere, Doom infiltrated Wakanda and managed to steal a large amount of processed vibranium. He ventured to his home nation, Latveria, where he began attacking various cities around the world by using the vibranium to manipulate all vibranium-based objects and structures. Storm, Shuri, the Dora Milaje, and the Fantastic Four were instructed to take out Doom’s worldwide network facilities, while T’Challa initiated a plan to save the world. The heroes later traveled to Latveria to confront Doom. T’Challa engaged in combat with Doom and managed to plant a remote device on him that made processed vibranium inert.The device was so powerful that all vibranium across the world became defunct. Doom’s newly acquired vibranium-based armor was rendered useless and he was defeated. T’Challa then returned to Wakanda to store some remaining active vibranium, that was recovered with the help of Storm, the X-Men, the Avengers, and the Fantastic Four. In order to defeat Doctor Doom, during the events of Doomwar, T’Challa was forced to destroy Wakanda’s vibranium reserves by making the substance inert. He then relinquished his authority of Wakanda to the current Black Panther, Shuri, as he left Wakanda to deal with his shame. He traveled to New York, where he reached an agreement with Matt Murdock (Daredevil) to become the new protector of Hell’s Kitchen. Murdock had decided to leave NY to deal with his morality issues due to what happened during the events of Shadowland. Thanks to some help from Foggy Nelson, T’Challa established an undercover identity as “Mr. Okonkwo”, the manager of the restaurant, “Devil’s Kitchen”. Through this civilian identity, T’Challa sought to familiarize himself with the surrounding crime ridden area. Part of this new venture, was to relinquish every aspect of the Black Panther identity. He no longer had his Wakandan tech, superhuman senses, nor vibranium suit. He refused to return to Wakanda until he redeemed himself through this personal voyage of self discovery. After Daredevil returned to New York, T’Challa decided to move back to Wakanda. There, he began to have dreams, which he interpreted as premonitions. In his dreams he saw Bast, the Panther God and his long time friend, Reed Richards (Mr. Fantastic). He reached out to Reed, offering him a summons to Wakanda, which he accepted. Once there, Reed assumed that he was there to talk about the vibranium reserves that T’Challa unwillingly had to make inert during the events of Doomwar. However, T’Challa assured him that his summoning of him was not about the vibranium. After Queen Shuri’s ceremonial feast was interrupted by the living dead, sent by the Jackal God (Anubis), T’Challa lead Reed to Wakanda’s Necropolis, leaving Shuri, Storm, and Invisible Woman to handle the undead. T’Challa, standing before the Panther Goddess and the souls of the dead Wakandan monarchs. Once there, the two met the Panther God. She confirmed to T’Challa that the dreams he were having were indeed premonitions, in fact, they were created by her to summon him to the Necropolis. She then asked him what he desired most. T’Challa tells her that he wants to become a king again. Bast then asked about his sister. If he were to become king again, then what would Shuri be to her, as all monarchs of Wakanda are crowned Black Panther and are then spiritually connected to Bast. T’Challa then recanted his statement, wishing nothing to happen to his sister. The powerful god stood and asked T’Challa what his true desires were once more. He responded by stating that he wanted to serve his people, but he will be whatever Bast wants him to be. Bast then dubbed T’Challa her personal Black Panther and crowned him king of Wakanda’s Dead City. She referred to him as “King of the Dead” and stated that he will have the strength and knowledge of every Wakandan king laid to rest in the Necropolis. She also vaguely predicted the events of AvsX. During the events of AvsX, the powerful cosmic entity of death and rebirth, known as the Phoenix Force, returned to Earth and began seeking a host. A young teenager named Hope was suspected to be the Phoenix’s targeted host. Because the young girl was a mutant, the X-Men want to offer her to the Phoenix, believing her to be the savior of the mutant race. However, the Avengers want to conceal the girl in fear that the Phoenix would corrupt her, making her a potential threat to mankind. The two factions then began to fight one another. The Phoenix is incidentally divided into five energies by Iron Man, with each part taking a host, all of whom were X-Men. Cyclops, Emma Frost, Colossus, Magik and Namor were bestowed and they began to reform the world to their will. Although some of their actions were generous and peaceful, the Avengers feared that such powerfully immense beings should not go unchecked. During the chaos that followed, T’Challa allied himself with the Avengers and Storm allied herself with the X-men. Many Wakandans were confused as to why their queen would ally herself with the X-Men and quickly declared her a traitor to the Wakandan Kingdom. T’Challa provided a safe-house for the Avengers in Wakanda. In search of them, Namor attacked and almost sank Wakanda, killing hundreds if not thousands of its citizens. T’Challa was saddened and infuriated at the X-men as he declared them all enemies of his country. Storm later arrived in Wakanda and saw what Namor had done. She then approached T’Challa as he grieved for the lives that Namor had taken. Out of frustration at what had just happened, he scolded her. She attacked him (to his surprise) and the two began to fight. The Wakandans were shocked and confused as to why she would attack him and the High Priest of Wakanda annulled the marriage. Long ago, sometime after the Kree-Skrull War, T’Challa, Iron Man, Doctor Strange, Mr. Fantastic, Black Bolt, Professor X and Namor met in Wakanda. Iron Man proposed that they form a government of superhumans similar to the United Nations that would meet regularly, in secret, to prevent an event like the Kree-Skrull War from happening again. After some debating, all except T’Challa agreed to form this “Illuminati.” T’Challa declined at the time, because he felt that the group would fail, due to them deciding that they were going to attempt to secretly govern the world. Sometime later, after the events of AvsX, T’Challa reconsidered joining the Illuminati after witnessing an event known as an “Incursion”. An incursion is when two alternate universes collide into each other with alternate Earths as the epicenter. T’Challa encountered Black Swan, a woman from an alternate Earth who had destroyed her own Earth to prevent it from colliding with Earth-616. T’Challa was on an expedition, in the jungles of Wakanda, with some potential candidates for Wakanda’s space program, when she attacked them. After Black Swan ordered her mercenaries to kill several of his candidates, T’Challa killed them and managed to capture her. He then contacted the Illuminati to report what he had just witnessed. Upon joining them, he swore to kill fellow Illuminati member, Namor, for attempting to sink Wakanda during the events of AvsX. The Illuminati and the Black Panther go on to deal with several more incursions, attempting to avoid doing what Black Swan had done, which was to destroy one alternate Earth to prevent it from colliding with another. However, the group finally realized that destroying the alternate Earths was their best option. As time progressed, the hostilities between Wakanda and Atlantis increased. In an attempt to end the feud, Namor presented a peace offering to T’Challa for him to relay to his sister, Queen Shuri, the current ruler of Wakanda. T’Challa presented the peace offering to Queen Shuri, but she discarded it, citing that Namor’s actions during AvsX was an act of terrorism. She then ordered an attack on Atlantis, while T’Challa distracted Namor with a fraudulent acceptance. The Hatut Zeraze, Wakanda’s secret police, went on to decimate Atlantis. The war conflict between the two men reached its breaking point during the Illuminati’s battle with the Great Society. T’Challa was poised to use an antimatter bomb to destroy the Society’s world in order to save Earth-616, but refused to do so, as it would mean killing billions of innocent people. Namor then stole the detonator away and destroyed the planet anyway, claiming that he had the guts to do what T’Challa and the others would not. T’Challa savagely attacked Namor, but their confrontation was interrupted by the Hulk. Namor was expelled from the Illuminati for his actions, and left to form a new iteration of the Cabal. For failing to destroy the Great Society’s world (thus proving he does not have the will to defend Wakanda no matter what), the spirits of T’Chaka and the other past Black Panthers chastise T’Challa and shun him. Eight months later, the Cabal had utterly decimated Wakanda. With the last survivors evacuated, T’Challa was given his father’s ceremonial dagger by Shuri just before she was killed by Proxima Midnight. The fugitive members of the Illuminati later joined forces with the Avengers after Namor begged for help, explaining that the members of the Cabal (particularly Thanos) had become too difficult to control. During the mission to trap the Cabal on an exploding world, T’Challa stabbed Namor and left him for dead. Unbeknownst to him, both Namor and the Cabal managed to survive. The latest elite Fine Art Statue in the Marvel Comics Presents Kotobukiya Collection adds a classic Avenger and royal hero with the mighty Black Panther! Lurking in the shadows and preparing to strike, Black Panther crouches on ancient ruins and keeps watch over his prey. The Avenger wears his iconic Wakandan vibranium costume, a sleek black bodysuit with integrated gloves, boots, and full mask plus a high collar and long cape. T’Challa watches intently through the menacing white eyes of his costume, and the outfit is accented with golden claws, belt, necklace of office, and feline-inspired armbands. Displaying the grace and patience of his namesake, Black Panther is tense and ready to attack with muscles taught and claws spread. The Avenger is intricately detailed with piping and creases on his costume, the subtle expression on his face through his mask, and of course his glorious flowing cape. 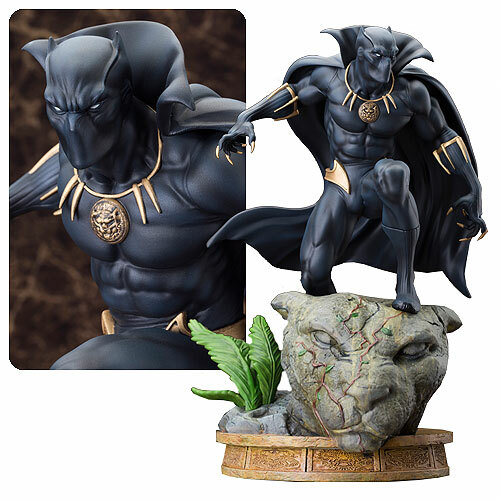 The Marvel Black Panther Fine Art Statue is made of resin and measures about 12-inches tall (1:6 scale) crouched atop a beautiful georama display base of an ancient panther statue overgrown with foliage. Black Panther Head 16 oz. Molded MugBring the Marvel cinematic universe to life with this amazing mug! This Black Panther Head Molded Mug features the likeness of T’Challa wearing his superhero costume as the mighty Black Panther. Mug holds up to 16 ounces of liquid. Hand wash only. Not dishwasher safe. Do not microwave. May the 4th is a well known holiday, for all Star wars fans. May 4th is always loved by it’s beloved fans and of course I am entailed into the Star wars fandom so please let me hear a “hell yea!” so for all you that have not seen “The force awakens” let it be known that the movie was a 10/10 and this is Disney everyone, but not to have a quick assumption the prequel of the upcoming Star wars film “Rouge one” we all know that May 4th haves it’s eternal history, but where have it originated? The tradition started rather organically, chosen by fans as a day to celebrate their love for the Star Wars movies and expanded universe. “May the Fourth” rhymes with “May the Force,” of course and you can figure out the rest out from there. Grassroots fandom perpetuated the pun, until the first large organized event for the day took place on May 4th, 2011 in the Toronto Underground Cinema. Screenings of the movies were accompanied by a costume contest judged by local radio hosts and TV stars, but while it may have been the first commercial Star Wars Day gathering, it certainly wasn’t the first time people had connected the day with the films. Thatcher, who officially became Prime Minister on May 4th of that year, never addressed the connection publicly, but the pun would be brought up again in British politics 15 years later. On May 4th, 1994, UK politician Harry Cohen mentioned the phrase in a House of Commons discussion about national defense, calling it a “very bad joke” before saying his researcher that made it deserved to be fired. Weirdly, British politicians seemed to rank just behind Star Wars obsessives in their affection for the pun, continuing to invoke it into the 21st century. In 2012, London Mayor Boris Johnson dropped the phrase to close out his re-election acceptance speech.